View cart “2000 Frost Fighter Tab Bonding Kit” has been added to your cart. Rear window defrosters have at least two metal clips located along the edge of the defroster. These tabs connect the defroster electrically to the vehicle’s power and ground. When these tab separate from the defroster they can be lost or damaged. 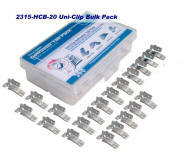 Uni-Clip tabs and Uni-Con Connectors are factory replacements which work with all vehicle defrosters and connectors including Ford, Honda, Toyota, Nissan, Subaru, GM, Chrysler and many others. 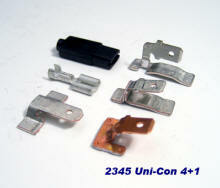 Uni-Con Defroster Connectors. Damaged defroster tab connectors should be replaced with the Uni-Con defroster connectors. They fit all makes and models and are easily crimped on the vehicles existing defroster wire for a finished factory quality look. How to choose the defroster right tab? 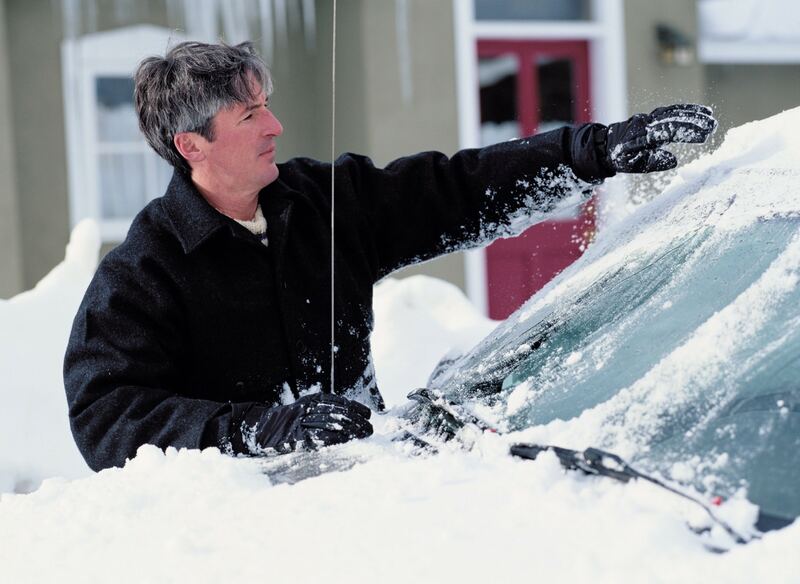 When a defroster tab breaks or comes off the glass a new tab is often required. But which one? We recommend taking close look at the undamaged tab still on the defroster and find a tab that looks similar from the tabs below. Don’t just go by the make and model of vehicle recommended as manufactures often mix and match tabs between auto makers. A visual match is the most reliable way to insure you get the right tab. In doubt? 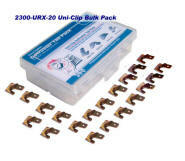 The 2300-URX is the most popular. Tab Bonding. To reattach tabs to the defroster use the Frost Fighter Defroster Tab Bonding Kit. The kits silver adhesive forms the electrical and structural connection in one simple operation. Specifically designed for tab bonding the adhesive’s high silver content provides the electrical conductivity needed to make reliable high amperage defroster repairs. If the defroster connector is missing or damaged replace it with the Uni-Con defroster connector. Defroster connectors can be damaged when tabs separate. These easy to attach replacement connectors crimp to existing defroster wiring using common tools in minutes and connects to all defroster tab makes and models. See tabs below. Use needle nose pliers to connect the defroster connector to the wire. Next snap close the black plastic cover for a factory quality defroster connector connected to the lead wire coming from the car ready to plug into the defroster tab . 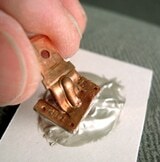 The connector installs in minutes and connects to all defroster tab makes and models. Featured on Ford and Chrysler vehicles, these tabs are compatible with all defrosters and connectors. Choose the tab that most closely matches the vehicle’s existing tab. Featured on GM and Chrysler vehicles, these tabs are compatible with all defrosters and connectors. Choose the tab that most closely matches the vehicle’s existing tab. Featured on GMC vehicles GMC Yukon / Suburban / Chevrolet Tahoe SUV but these tabs are compatible with all defrosters and connectors. Choose the tab that most closely matches the vehicle’s existing tab. Featured on Toyota, Honda and Nissan vehicles, these tabs are compatible with all defrosters and connectors. Choose the tab that most closely matches the vehicle’s existing tab. Featured on Toyota, Honda and Subaru vehicles, these tabs are compatible with all defrosters and connectors. Choose the tab that most closely matches the vehicle’s existing tab. 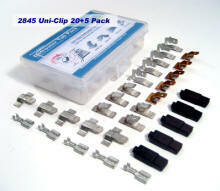 The Uni-Clip four tab pack includes one defroster tab of each type for maximum compatibility with any defroster. The Uni-Clip five pack includes one defroster tab of each type PLUS the Uni-Con defroster connector for maximum compatibility with any defroster repair. Pro Plus defroster repair kits include twenty five tabs of each type, five Uni-Con defroster connectors PLUS the tab bonding kit and trouble lamp. Great for professionals. 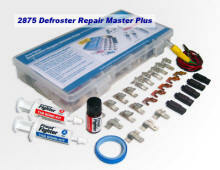 Master Plus defroster repair kits add grid repair to the Pro Plus kit. This is a one stop defroster kit with everything needed to repair the most demanding defroster damage. The twenty tab pack includes five Uni-Clip defroster tabs of each type for maximum compatibility with any defroster. Ideal for professional defroster repair. 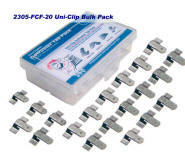 The twenty plus five tab pack includes five Uni-Clip tabs of each type PLUS five Uni-Con defroster connectors for multiple defroster repairs. 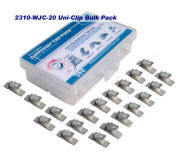 The twenty tab bulk pack is ideal for professionals repairing defrosters in garages, auto body and glass shops.